Biomarkers are an integral part of cancer management due to their use in risk assessment, screening, differential diagnosis, prognosis, prediction of response to treatment, and monitoring progress of disease. Recently, with the advent of Chimeric Antigen Receptor (CAR) T cell therapy, a new category of targetable biomarkers has emerged. These biomarkers are associated with the surface of malignant cells and serve as targets for directing cytotoxic T cells. The first biomarker target used for CAR T cell therapy was CD19, a B cell marker expressed highly on malignant B cells. With the success of CD19, the last decade has shown an explosion of new targetable biomarkers on a range of human malignancies. These surface targets have made it possible to provide directed, specific therapy that reduces healthy tissue destruction and preserves the patient’s immune system during treatment. As of May 2018, there are over 100 clinical trials underway that target over 25 different surface biomarkers in almost every human tissue. This expansion has led to not only promising results in terms of patient outcome, but has also led to an exponential growth in the investigation of new biomarkers that could potentially be utilized in CAR T cell therapy for treating patients. In this review, we discuss the biomarkers currently under investigation and point out several promising biomarkers in the preclinical stage of development that may be useful as targets. As the new paradigm shift in cancer treatment, immunotherapy is the epitome of personalized medicine, as a patient’s immune system is enlisted to fight their own cancer. Originally manifest as monoclonal antibody therapy, immunotherapy now has a broadened definition that encompasses tumor vaccines, checkpoint blockades, bispecific antibodies, tumor infiltrating lymphocytes (TILs), and most recently, chimeric antigen receptor (CAR) T cell therapy. T cells are a critical component of the adaptive immune system as they not only orchestrate cytotoxic effects, but also provide long term cellular ‘memory’ of specific antigens . Commonly, a patient will have TILs specific for their tumor but these cells are often retrained by the tumor microenvironment to become anergic and nonfunctional . T cells endogenously require the interaction between MHC displayed peptides and their TCR to activate , but CAR T cells have been engineered to activate via a tumor-associated or tumor-specific antigen (TAA and TSA, respectively). CAR T cells are a “living drug” comprised of a targeting domain (single chain variable fragment (scFv), peptides, polypeptides, ligands, muteins, etc.) fused to the signaling domain of a T cell [4, 5]. Upon recognition and binding to the scFv target, the T cell activates and subsequent target cell killing is initiated. CAR T cell therapy has been revolutionary in the treatment of hematological malignancies with the targets CD19 and CD20 but has been unable to translate effectively to solid tumors. A major drawback for CAR therapy in solid malignancies is the lack of cancer-specific tumor targets. While hematological malignancies do not necessarily require complete antigen target specificity towards cancer cells, solid tumor targets are more delicate and targets ideally cannot be expressed on normal tissue. With the struggles facing CAR T cell therapy (on-target off-tumor cytotoxicity, persistence in vivo, immunosuppressive tumor microenvironment, cytokine release syndrome, etc. ), biomarker discovery and specificity is essential for further CAR T cell development and success. 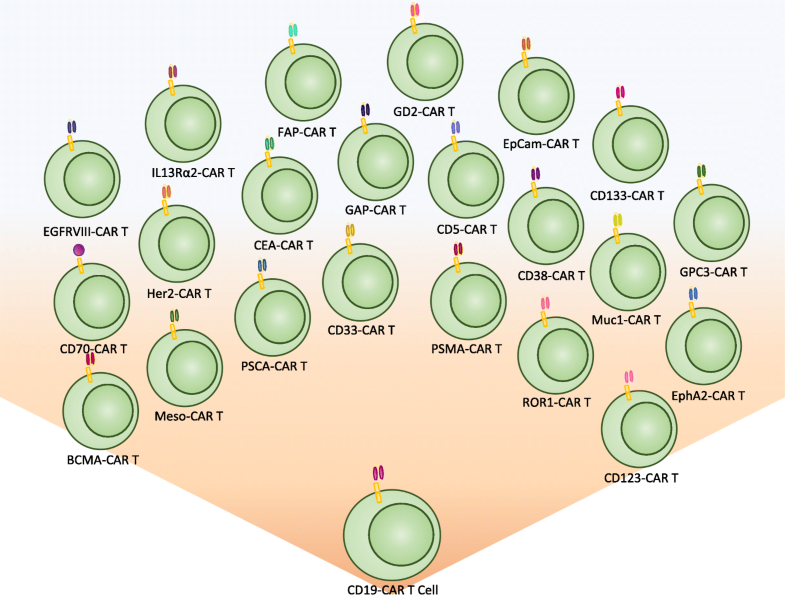 With over 300 CAR T cell therapy clinical trials ongoing in CAR therapy as of May 2018, there has been an equally impressive effort to identify and characterize TAA or TSA surface biomarkers in solid tumors. Biomarkers have been an integral component of cancer for several decades, and with the expansion of CAR T cell therapy, a new category of therapeutic biomarkers has arisen. These markers can be used to direct CAR T cells to malignant target cells (Fig. 1). The effort to identify and characterize these therapeutic biomarkers has been substantial and has increased exponentially over the last decade. 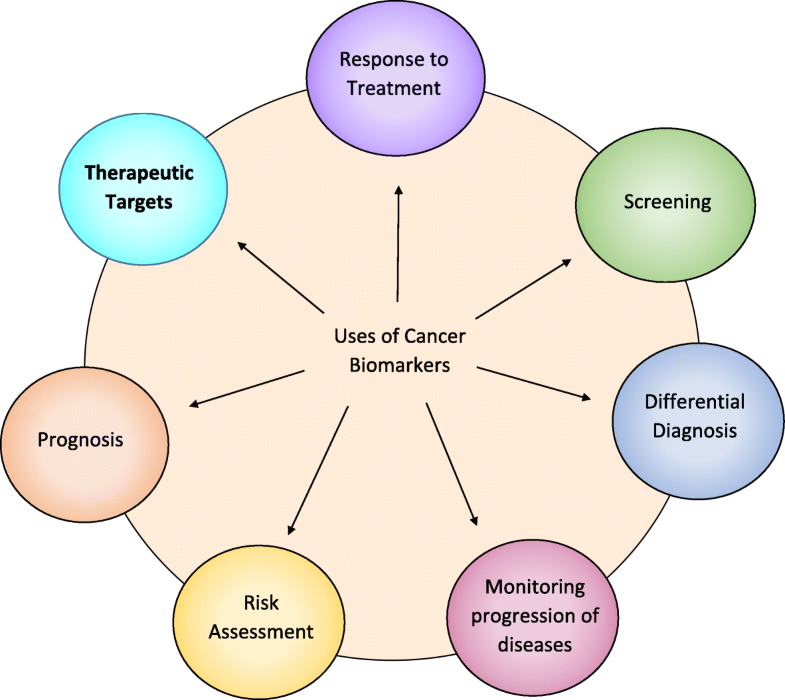 As a result, 18 surface biomarkers are currently being evaluated in clinical trials (Fig. 2). In addition, there is also a significant number of pre-clinical biomarkers that have shown promise as targets for CAR therapy due to their unique expression on cancer cells. Here, we summarize the biomarkers currently under investigation in clinical trials for both hematological and solid malignancies, along with those that may prove useful in future CAR therapies for solid tumors. CAR T cell therapy was initially conceptualized in 1989  and was recognized as an effective therapeutic after targeting CD19 for the treatment of lymphomas and leukemias [7–9]. This led to an exponential growth in CAR therapy and as a direct consequence, in surface biomarker discovery (Fig. 3). In 2012, there were a total of 5 clinical trials, four targeting CD19 and one targeting Mesothelin. This number has continued to grow and the number of biomarkers tested in a clinical setting has also expanded from 2 to 25. The year 2017 saw more clinical trials than any previous year with 111 initiated, targeting 17 different biomarkers (Table 1). This growth demonstrates not only the efficacy of CAR T cell therapy, but also the huge push in immunotherapy to find new and better targets. exact function of mesothelin in these normal mesothelial cells is unclear. Activate intracellular signaling pathways in response to extracellular signals. As the most studied and researched target for CAR therapy, CD19 has shown impressive success in clinical settings to treat Acute Lymphoblastic Leukemia (ALL), Non-Hodgkin Lymphoma (NHL), and Chronic Lymphocytic Leukemia (CLL) . Despite the high levels of complete response rates in patients, relapse from CD19 CAR therapy can occur via a suppressive tumor microenvironment or antigen escape [11–13]. With this in mind, new targets are being identified and evaluated to treat hematological malignancies. Among these new targets are CD5, CD123, CD33, CD70, CD38, and BCMA. These same targets have already shown promise using drug-conjugated antibodies, and several have been FDA approved for treatment (Figs. 1, 2, 3 and 4). These biomarkers are now being evaluated as targets for adoptive T cell CAR therapy to treat hematological malignancies. CD5 is a negative regulator of TCR signaling and is expressed on the surface of most T cells and on a specific subpopulation of B cells (B-1) found most commonly in fetal cells  (Fig. 4a). CD5 has high expression in approximately 80% of T-cell acute lymphoblastic leukemia (T-ALL) and T cell lymphomas along and also has significant expression on B-cell lymphomas . CD5 was first utilized as an immunotherapy treatment via immunotoxin-conjugated antibodies [16–22] that aided in the depletion of malignant T cell populations in treated patients. 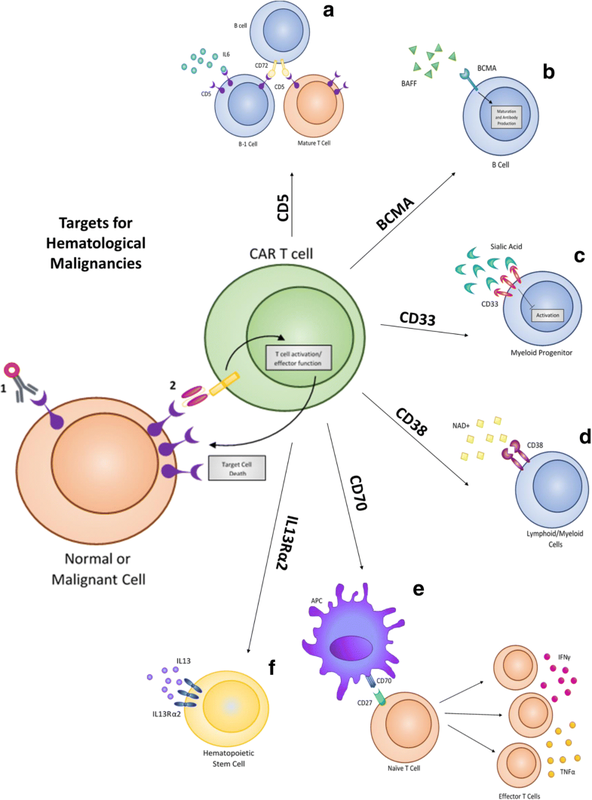 More recently, CD5 has been utilized as a CAR target to treat T cell malignancies directly. As CD5 is not cancer specific, this treatment results in T cell aplasia [23, 24]. While this therapy is effective in eliminating malignant T cells, sustained T cell aplasia is a potentially undesirable outcome of treatment. Interleukin-3 receptor alpha chain (IL3Rα or CD123) is a surface receptor found overexpressed in several hematological malignancies including blastic plasmacytoid dendritic cell neoplasm (BPDCN) , hairy cell leukemia [26, 27], B-cell acute lymphocytic leukemia (B-ALL) [26, 28], and Acute myeloblastic leukemia (AML) [29, 30]. As the receptor expression is limited on hematopoietic stem cells, the receptor has promising use as a targetable biomarker for CAR therapy [30, 31] (Fig. 4f). Initial targeting of IL3Rα was conducted utilizing the natural ligand, IL-3, but CAR T cell approaches are now being utilized to further target this receptor to treat primarily AML patients. Initial trials with CD123 CAR cells showed potent cytotoxicity against AML cells within mice [32–35] and in human patients . This preliminary success has led to its further testing in clinical trials, evaluating this therapy for both safety and efficacy against AML. IL3Rα, like CD5, is not cancer specific, and the consequence of CD5 CAR T cells is severe myeloablation [37, 38]. CD33 is a transmembrane receptor that binds sialic acid and causes inhibition of activation. The protein is expressed on AML blasts and normal myeloid progenitors [39–43] (Fig. 4c). Because CD33 is absent in adult pluripotent hematopoietic stem cells and has elevated expression on approximately 85–90% of AML patients, the antigen has gained clinical significance as a TAA [44–46]. In initial trials testing the efficacy of CD33 CAR T cells, patients showed signs of an inflammatory reaction in response to infused CAR T cells: chills, fever, and elevated cytokine levels. This resulted in reduced blasts within the bone marrow following two weeks of therapy . Following these preliminary tests, clinical trials are ongoing to determine if CD33 is a safe and effective treatment for myeloid leukemia. CD70 is a target that is being utilized to treat both hematological malignancies as well as solid tumors (Table 1). CD70 is the membrane-bound ligand of the CD27 receptor (TNF superfamily) [48–50] (Fig. 4e). Expression of CD70 is limited to diffuse large B-cell and follicular lymphomas, as well as Hodgkin’s lymphoma, multiple myeloma, and EBV-associated malignancies [51–55]. Additionally, CD70 is also expressed on other malignancies such as glioma [56–59], breast cancer [60, 61], renal cell carcinoma [51, 62–64], ovarian cancer [65–67], and pancreatic cancer [65, 68]. Targeting this antigen is feasible as CD70/CD27 signaling is not essential for the development of a functional immune system as CD27−/− mice recover from infection in a similar time frame as CD27WT mice [69, 70]. Targeting was first performed using monoclonal antibodies against CD70, and this showed promise in animal models [51, 71, 72]. CD70 CAR T cells contain the human CD27, the natural binding partner of CD70, fused to the CAR signaling domain . CD38 is a glycoprotein associated within lipid rafts and is specific to cell surface receptors that function to regulate calcium flux and mediate signal transduction in both lymphoid and myeloid cells [73–75]. While CD38 is expressed consistently on myeloma cells [73, 76], it’s expression is limited on normal lymphoid and myeloid cells  (Fig. 4d). As a TAA, CD38 has been used as a target via monoclonal antibody treatment (Daratumumab) , which was approved by the FDA in 2015 for patients with multiple myeloma . Daratumumab showed an overall response rate of 31%, which demonstrates the success of utilizing CD38 as a target. CD38 CAR T cells have shown similar efficacy against double-hit lymphoma cells (MYC rearrangement along with BCL2 or BCL6 rearrangement) . With promising data, CD38 CAR T cells are currently in phase I trials against myeloma to test safety and dosing. B cell maturation antigen (BCMA) is a TNF receptor that binds B-cell activating factor (BAFF) and is universally expressed on myeloma cells but has insignificant expression on major adult organs  (Fig. 4b). BCMA is exclusively expressed in B-cell lineage cells, and is expressed during plasma cell differentiation . In preclinical models, anti-BCMA CAR T cells have shown effective killing of myeloma cells both in vitro and in vivo [82, 83]. Following Phase I safety studies, some patients experienced neurotoxicity and cytokine release syndrome, which are common side effects of CAR T cell treatment . Other side effects of targeting BCMA are similar to those of other hematological malignancies, as patients suffer from partial or complete B cell aplasia. While CAR T cell therapy has been very successful against hematological malignancies, it has been challenging to apply this technology to solid tumors. This challenge has resulted in a strong effort to discover biomarkers for solid malignancies. As such, there are 17 biomarkers currently in clinical trials for solid tumors (Fig. 5). Mesothelin (MSLN), the second most frequently targeted biomarker after CD19, has emerged as an attractive target for cancer immunotherapy. MSLN is a cell-surface glycoprotein with presence in the sera of cancer patients as soluble MSLN-related peptide (SMRP). Within normal tissue, the expression of MSLN is restricted to mesothelial cells lining the pericardium, peritoneum, and pleura. Yet, in cancer cells, MSLN is overexpressed on nearly a third of human malignancies . Elevated levels of MSLN have been reported on ovarian cancers [86, 87], non-small-cell lung cancers [88, 89], breast cancers [90, 91], esophageal cancers , colon and gastric cancers , and pancreatic cancers . In addition, Lamberts et al. reported MSLN expression in other solid tumors such as thyroid cancer, renal cancer, and synovial sarcoma . The biological function of MSLN is nonessential given that MSLN−/− mice do not show any phenotypic abnormalities . However, the overexpression of MSLN has been associated with cancer cell proliferation, increased local invasion and metastasis, and resistance to apoptosis induced by cytotoxic agents [91, 97–99]. MSLN-CAR T cells have been created and tested against ovarian cancer, and lung cancer . These CAR T cells have shown significant increases in T cell proliferation, T cell redistribution to metastatic sites, reduction in tumor burden, and increased overall survival. This promising pre-clinical data has led to several Phase I clinical trials to test the safety and efficacy of MSLN CAR T cell therapy against several tumors. Initial Phase I clinical trials have shown transient expression of the MSLN-CAR T cells and minimal cytokine release syndrome or on-target, off-tumor effects (NCT01355965, NCTO 02159716 & NCTO01897415). A single infusion of MSLN-CAR T cells resulted in decreased tumor burden and patients had no signs of long-term toxicities 1–2 months post infusion . HER2 (Human epidermal growth factor 2) is a transmembrane tyrosine kinase in the ERBB family. The HER2 receptor plays an important role in normal cell growth and differentiation, activating PI3K/Akt and RAS/Raf/MEK/MAPK pathways . Studies have reported HER2 protein overexpression, gene amplification, and mutation in many cancers including breast, lung, colorectal, brain, ovarian, and pancreas . Overexpression of HER2 has been found to be associated with increased tumor cell proliferation and invasion , decreased response to hormonal treatment , and resistance to apoptosis . HER2 has been targeted utilizing DNA vaccines, peptide vaccines, and dendritic vaccines which have shown promising results in both preclinical and early clinical studies [106, 107]. Trastuzumab, a humanized monoclonal antibody developed to target overexpressed HER2 receptor, has also shown success as an immunotherapy treatment. Trastuzumab, along with chemotherapy, has increased overall survival and risk of recurrence compared to chemotherapy alone in HER2 overexpressing breast cancer patients . Several groups have reported the anti-tumor activity, persistence, and application feasibility of HER2 CAR T cells preclinically in HER2 overexpressing cancer as an alternative targeted therapy [109–111]. The success of preclinical experiments of HER2 CAR T cell has led to the initiation of several clinical trials for the treatment of various cancers [112–114]. Additionally, Her2 is also used as a target in combinatorial therapy engaging multiple targets as well as modified receptors that enhance T cell signaling. T1E28z CAR T cells engage multiple ErbB dimers, including Her2-containing heterodimers. The CAR is co-expressed with a chimeric cytokine receptor called 4αβ that amplifies mitogenic stimulus delivered by IL-4, providing a convenient tool to enrich CAR T cells ex vivo . Initial trials using these combinatorial CARs have shown safe intra-tumoral administration in patients with advanced head and neck squamous cancer . GD2 is a ganglioside antigen that is expressed on the surface of several malignancies including neuroblastoma , glioma, cervical cancer, and sarcoma [118, 119]. The normal expression of the protein is limited to neurons, melanocytes, and peripheral nerve fibers [119–121]. One of the most successful trial reports for CARs in solid tumors has been using GD2 as a target for neuroblastoma [122–125]. Not only did GD-2 CAR T cells induce a response in 30% of patients, including a complete remission in 3 patients, but researchers found long term persistence of the CAR T cells post treatment, which subsequently reduced tumor recurrence/progression . Meanwhile, GD2 monoclonal antibodies (Dinutuximab) have been effective for the control of neuroblastoma [119, 126–128] and this product is currently FDA approved for that application. There have been some observed cytotoxicities associated with targeting GD2, such as sensorimotor demyelinating polyneuropathy presumably caused by on-target toxicity affected myelinated peripheral nerve fibers . In preclinical models, severe lethal CNS toxicity caused by CAR T cell infiltration and proliferation within the brain resulted in neuronal destruction . Therefore, although there has been success utilizing CAR therapy in patients, necessary precautions need to be taken to avoid neurotoxicity as GD2 has expression in normal neural cells. GD2, as of May 2018, has 10 ongoing clinical CAR T cell trials targeting primarily neuroblastoma. A majority of these clinical trials are in phase I status to determine the safety of the treatment. One of the clinical trials (NCT02765243) is testing the incorporation of a kill switch, which is an engineered suicide gene (iCasp9) to help avoid neurotoxicity. MUC1 is a large transmembrane glycoprotein that is transcriptionally upregulated in breast and ovarian tumors [130, 131]. MUC1 expression is confined to normal luminal epithelium, and the expression is lost upon transformation [132–136]. 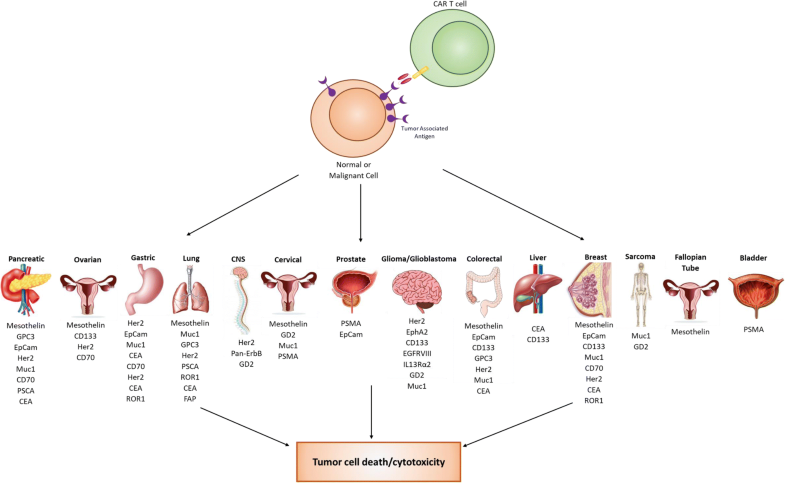 MUC1 has recently become an interesting target in cancer immunotherapy because of the overexpression of aberrantly glycosylated MUC1 in most solid tumors and several hematological malignancies. This is in addition to the role of MUC1 in cancer progression, invasion, metastasis, angiogenesis, and chemoresistance. Although expressed significantly on malignant cells, MUC1 targeting presents some complications as MUC1 is shed and may inhibit tumor antibody binding/recognition . MUC1 also has the ability to inhibit T cell function and thereby promotes an anti-inflammatory TME . CAR T-cell therapy targeting MUC1 has been beset with several challenges such as steric hindrance and glycosylation-related epitope heterogeneity . Following CAR optimization with tripartite endodomains and high affinity screening for effective ScFv fragments, MUC1-CAR T cells showed significant delays in tumor growth in mouse xenograft models . MUC1-CAR T cells also show enhanced proliferation, increased IFN-ϒ secretion, and enhanced anti-tumor efficacy when compared to control CAR T cells in vitro . Based on the success of these preclinical MUC1-CAR T cells, several clinical trials targeting MUC1 in several cancer types have begun. Early phase 1 clinical trials revealed no initial adverse side-effects and patient cytokine levels increased, indicating a positive response as tumor necrosis was observed . Glypican-3 (GPC3) is a GPI bound sulfate proteoglycan involved in cellular growth, differentiation, and migration [142, 143]. GPC3 shows elevated expression in approximately 75% of hepatocellular carcinoma samples, but had no expression in corresponding normal tissue [144, 145]. 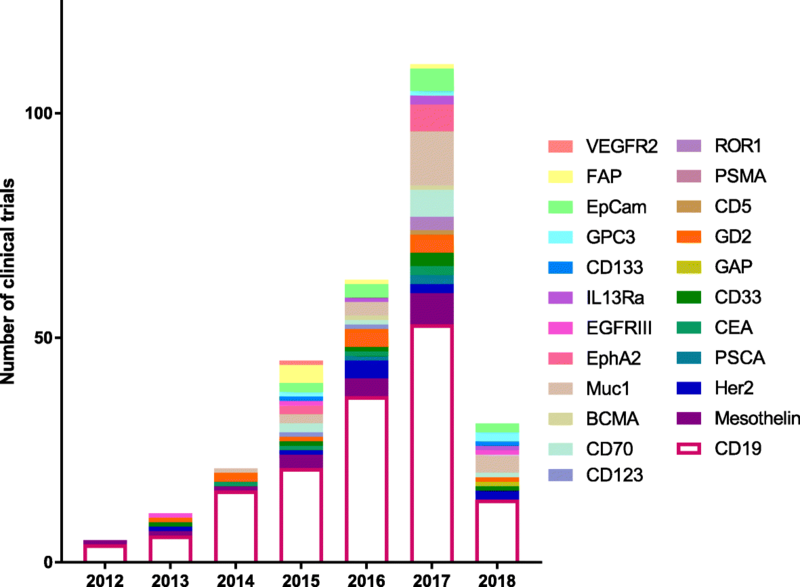 GPC3 is also elevated within breast cancer , melanoma , and pancreatic cancer [148, 149] demonstrating its use across a wide variety of cancer types. GPC3 CAR T cells showed promising preclinical results targeting tumors in mouse xenograft models . In human trials there was minimal toxicity and all patients tolerated the treatment (NCT02395250) . Further clinical trials targeting lung cancer, pancreatic cancer, and colorectal cancer are ongoing. There are currently two clinical trials, one initiated in 2015 and one in 2018, testing the efficacy and safety of IL13Rα2 directed CAR T cells against glioma patients. IL-13 is a T helper 2 (TH2) derived cytokine involved in immune regulation. IL13Rα2 is an IL-13 receptor that acts as a decoy by directly competing with the IL13Rα1 receptor to elicit downstream STAT signaling [152, 153]. IL13Rα2 receptors are upregulated in approximately 50% of glioma patients and have a strong correlation with poor survival . As a gene that is highly expressed in tumor infiltrating macrophages (TIM) and tumor-associated macrophages (TAM), but shows minimal expression in normal brain tissue, IL13Rα2 has been previously studied as a cancer vaccine, and more recently as a direct target for CAR therapy. Initially, IL13Rα2 CAR T cells were developed utilizing a membrane-tethered IL13 ligand mutated at residue 13 (E➔Y)  as the antigen recognition domain. Unfortunately, it was determined that these domains also recognized IL13Rα1 receptors as well, which raised significant safety concerns. New CAR T cell constructs targeting IL13Rα2 therapy rely on scFv-based targeting. With this modification in antigen specificity, scFv-based IL13Rα2 CARs induce tumor regression in mouse xenograft models of glioma and show insignificant recognition of IL13Rα1 receptors . In 2016, a patient who received Il13Rα2 CAR T cells through two intracranial delivery routes followed by infusions into the ventricular system over 220 days showed regression of all intracranial and spinal tumors which continued 7.5 months after the initiation of the therapy . This remarkable sustained response by this patient demonstrates the promise of targeting IL13Rα2. Prostate stem cell antigen (PSCA) is a serine protease [157, 158] expressed in the basal cells of normal prostate cells  and is overexpressed in approximately 80% of prostate cancers [160–163]. In addition, PSCA expression increases with both high Gleason score, and metastasis . The expression of PSCA is limited to the basal cell epithelium in the prostatic epithelium . As a protein attached to the cell surface via a GPI-anchor, it serves as an ideal target for prostate cancer and further metastatic sites . PSCA has also been found expressed on other cancer types such as gastric cancer, gallbladder adenocarcinoma [164–166], non-small-cell lung cancer [159, 167], ad pancreatic cancer . In humanized mouse models, CAR T cells targeting PSCA induced significant antitumor activity in pancreatic cancer . Although initial results have been promising, preclinical reports have shown that tumors can escape PSCA-CAR T cells and while treatment does prolong survival, it does not necessarily eradicate PSCA-expressing tumors [169, 170]. Vascular endothelial growth factor receptor 2 (VEGFR2) is an important mediator of tumor angiogenesis [171, 172]. VEGFR2 is involved in microvascular permeability, endothelial cell proliferation, invasion, migration, and survival . Overexpression of VEGFR2 has been associated with increased metastasis in several malignancies [174, 175], and VEGFR2 expression has also been shown on squamous cell carcinomas of the head and neck , colorectal cancer [177, 178], breast cancer [179, 180], and NSCLC [181–183]. While overexpressed in cancer, the expression of VEGFR2 in normal tissue is restricted to endothelia and mesothelial . Initial targeting of VEGFR2 with monoclonal antibodies has resulted in growth inhibition and decreased micro vessel density while simultaneously inducing tumor cell apoptosis and necrosis [185, 186]. These preclinical results have been shown in NSCLC, renal carcinoma, hepatocellular carcinoma, melanoma, ovarian cancer, and colorectal cancer [174, 187–191]. To date, only one clinical trial has been enrolled utilizing CAR T cells against VEGFR2 (NCT01218867) . Carcinoembryonic antigen (CEA) is a glycoprotein on the surface of several carcinomas . The most studied use for CEA as a surface biomarker has been in liver metastasis, especially originating from colorectal cancer [194–196]. CEA is also significantly expressed on the surface of gastric cancer, pancreatic cancer, ovarian cancer, and lung cancers . While CEA is expressed on the surface of some normal cells, including epithelial cells in the pulmonary tract and in the gastrointestinal tract, these normal sites of expression are invisible to immune detection as CEA is restricted to the apical surface of the epithelial cells that face the lumen in normal adults [198, 199]. As the cells are ‘invisible’ to immune detection it renders CEA an attractive target with limited bystander cytotoxicity. Following cancer development, epithelial cells lose apical polarity, which subsequently results in CEA gaining access to the blood stream and into the serum of the patient . This renders CEA a useful diagnostic biomarker, as serum detection can serve to identify cancer development for several cancer types including breast [201–203], skin cancer , NSCLC [205–207], gastric [202, 208–211], and pancreatic cancer [202, 212–215]. Preclinical testing with CEA-CAR T cells has shown that lymphodepletion or myeloablation prior to infusion is required to induce a response in mice with CEA+ tumors . Initially, CEA was targeted utilizing engineered TCRs, but trials were halted as patients developed severe colitis as a result of off target killing of normal epithelial cells . These same results have yet to be observed with CAR T cell therapy targeting CEA, but patients are treated with caution to avoid on-target, off-tumor cytotoxicity. Prostate specific membrane antigen (PSMA), or Glutamate carboxypeptidase II (GCPII) , is a glycoprotein  with three known activities including folate hydrolase , NAALADase , and dipeptidyl peptidase . While PSMA is expressed in normal prostate epithelium , it has been shown in 90% of human prostate tumors including their respective metastatic sites [158, 220, 221]. PSMA has also been expressed in low levels in salivary glands, brain, and kidneys [222–224]. In initial pre-clinical models, anti-PSMA CAR T cells were able to effectively target and eliminate 60% of tumors in treated animals while significantly improving overall survival in viv o . Following Phase I clinical trials, no anti-PSMA toxicities were noted and 40% of patients achieved clinical partial responses (PR) . More recently, PSMA CAR T cells have been designed to resist TGFβ suppression, which is commonly found in prostate cancers, via a negative TGFβ receptor II . In patients with castrate metastatic prostate cancer, PSMA-CAR T cell therapy is not only safe, but patients experience cytokine production suggestive of persistence of T cells in the blood for up to 2 weeks (NCT01140373) . Receptor tyrosine kinase like orphan receptor 1 (ROR1) is a Wnt5a surface receptor expressed during embryonic development, but generally absent from adult tissue with the exception of adipocytes, gut, pancreas, and parathyroid glands [228–230]. In the case of cancer, ROR1 has shown high levels in several solid malignancies: pancreatic [231, 232], ovarian [231, 233–235], breast [231, 236–238], lung [231, 239, 240], gastric cancer , and colorectal cancer . High levels of ROR1 have shown strong correlation to poor patient outcome and also to developing metastasis [235, 243]. There has been some conflicting preclinical studies where CAR T cells targeting ROR1 have demonstrated severe cytotoxicity as the cells accumulated within the lungs . Meanwhile, other studies have shown great success in targeting ROR1, which may be a direct cause of the specificity of the antibody utilized for the scFv [245, 246]. Currently, ROR1 is being used in clinical trials to target breast and lung cancers. Fibroblast activation protein (FAP) is a transmembrane serine protease with high expression on cancer-associated stromal cells (CASC) in epithelial cancers [247–249]. In pancreatic tumors, FAP shows significant elevation and is correlated with worse clinical outcome . In colorectal cancer, patients with high levels of FAP were more likely to develop metastasis, recurrence, and aggressive disease progression . FAP does not have this same expression within normal cells, as most stromal cells have insignificant levels of the protein [252–254]. As a therapeutic target, FAP has been utilized as a useful cancer vaccine in inhibiting tumor growth and increasing cytotoxicity [247, 255, 256]. As the biomarker has shown success as a targeting agent, CAR T cells targeting FAP have been developed. These FAP CAR T cells show conflicting results as some groups report limited antitumor efficacy , while others report significant tumor cytotoxicity with minimal off-tumor killing  along with prolonged survival . While the use of FAP CAR T cells may extend to many different organ sites, current clinical trials are designed to treat pleural mesothelioma. Epithelial cell adhesion molecule (EpCAM or CD326) is a transmembrane glycoprotein that functions to abrogate E-cadherin-mediated cell adhesion, and functions within transcriptional complexes inducing c-myc and cyclin A & E expression [260, 261]. EpCAM has shown overexpression in a range of tumors including colon adenocarcinoma, stomach adenocarcinoma, pancreatic adenocarcinoma, lung adenocarcinoma, ovarian adenocarcinoma, breast adenocarcinoma, and AML [262–265]. The protein is found at the basolateral cell membrane of normal adult tissue . EpCAM has shown significance as a biomarker for early cancer development . Like several other biomarker targets described, antibody therapy targeting EpCAM (Catumaxomab) has been used in patients to treat peritoneal carcinomatosis (PC) which resulted in a slight increase in survival . Further clinical trials with Catumaxomab have been used to target bladder cancer , head and neck cancer , ovarian cancer , and metastatic disease . These trials resulted in an increase in overall patient survival. EpCAM specific CAR T cells have been developed to treat prostate, breast, and peritoneal cancers and have shown suppressed tumor progression/delayed disease as well as CAR T cell trafficking into the tumor site [273–276]. Epidermal growth factor receptor variant III (EGFRvIII) is a gain of function mutated EGFR that arises from the genomic deletion of exons 2–7. The deletion of these exons leads to a ligand-independent receptor that endows cells with a significant growth advantage over normal cells . EGFRVIII is commonly found within glioblastoma patients, especially in CD133+ glioblastoma cancer stem cells . As a tumor-specific antigen, EGFRvIII has been targeted utilizing FDA approved cancer vaccines (Rindopepimut), which result in significant improved survival . Due to its success as a cancer vaccine, CAR T cells have been developed to directly target malignant cells expressing EGFRvIII. These CAR T cell therapies have shown delayed tumor growth, elimination of EGFRVIII+ tumor cells, and increased pro-inflammatory cytokine release in an antigen dependent manner [280–283]. A first-in-human study of intravenous delivery of a single dose of autologous EGFRvIII-CAR T cells (NCT02209376) had reported that the infusion of cells was feasible and safe, with no off-tumor toxicity or cytokine release syndrome. In this study, 10 patients with recurrent glioblastoma (GBM) were treated with EGFRvIII-CAR T cells. At least one patient achieved stable disease for over 18 months with a single infusion of CAR T cells. The median overall survival was about 8 months in all patients. The study, however, found that tumor microenvironment increased the expression of inhibitory molecules and infiltration by regulatory T cells which suppressed effector CAR T cell functions . While there are promising results using this target, there may be suppressive factors that limit its efficacy in patients. There are nine clinical trials ongoing (as of May 2018) targeting a variety of tumor types. Ephrin type A receptor (EphA2) is a receptor tyrosine kinase that plays a key role in the development of cancer disease. EphA2 enhances tumorigenesis and progression via interactions with other cell-surface receptors such as EGFR and HER2/ErbB2, which in turn amplify MAPK, Akt, and Rho family GTPase activities [285–287]. EphA2 has shown expression in normal brain, skin, bone marrow, lung, thymus, spleen, liver, small intestine, colon, bladder, kidney, uterus, testis and prostate at low levels [288, 289]. Overexpression of EphA2 has been observed in malignant tissue which has been linked to poor clinical prognosis [290–292]. EphA2 has been targeted through a variety of avenues including viral vectors, RNA interference, small molecule inhibitors, recombinant proteins, and immunotherapy. Small molecule inhibitors (FDA approved-Dasatinib) of EphA2 have significantly reduced tumor growth in several cancer types, and have shown anti-tumor efficacy via the reduction of EphA2 expression and kinase activity upon treatment [293, 294]. On the heels of the success of these methods, CAR T cells have been developed to target EphA2 in Lung cancer , glioma , and glioblastoma  which have all demonstrated cytotoxic effects both in vitro and in vivo . To aid in providing both specificity and longevitiy of CAR T cells, efforts have been made to combine different biomarker targets to elicit T cell responses. Initially designed as enhancers of co-stimulation , these CARs are termed “tandem CARs” and are designed to express two antigen binding domains. Following binding of both scFv fragments, CAR T cells are able to send an activation signal and elicit target cell death, but are unable to do this if only one scFv binds . BCMA CAR T cells have been linked to CS1-CAR T cells and designed to express both CAR molecules on the cell surface. They found that this combination elicited potent and specific anti-tumor activity through both antigens in vitro and in vivo . HER2/IL-13RA2 CAR T cells have been designed and showed additive T cell activation when both receptors were engaged, resulting in superior sustained activity . ErbB2/MUC1 CAR T cells have been shown to kill ErbB2 expressing cells efficiently and proliferate in a MUC1 dependent manner . Meanwhile, pan-ErbB CARs are designed to target 8 distinct homo- and hetero-dimers formed by the ErbB network . These tandem CARs avoided antigen escape, which is the primary drawback from CAR therapy as cancer evolves to sequester target antigen expression. CD20/CD19 tandem CARs have also been developed, but showed no difference between tandem CAR killing and single antigen specificity CARs in this context . This demonstrates that only certain combinations of biomarker targets are effective in a tandem CAR design. CD19 has also been combined with Her2 and showed the engineered cells could preserve the cytolytic activity of T cells . This is an ongoing worthwhile pursuit to develop CARs that have specific killing with minimal cytotoxic effects to healthy tissue. By activating upon two ScFv signals, bystander organ killing could be reduced as different antigen combinations can decrease on-target, off-tumor killing. In addition, as another mechanism to enhance CAR efficacy in vivo, CAR T cells are also being constructed to induce transcriptional activation of synthetic notch receptors upon antigen binding. By combining this form of activation with a standard CAR target, cytokine secretion profiles, T cell differentiation, and local delivery of therapeutics can be controlled . In an effort to increase CAR–tumor specificity and reduce off-tumor toxicity inhibitory chimeric antigen receptors (iCARs) have been developed to ensure healthy tissue is not targeted by CAR T cells. iCAR cells are designed with an ingrained override signal. When in contact with only the tumor antigen, CAR T cells elicit a cytotoxic response to the target cell, but when in contact with normal tissue antigens, the T cells are effectively turned ‘off’ via anti-inflammatory co-stimulation. This new technique may provide a way for biomarkers to be used in combination to elicit extremely specific effects within cancer and avoid healthy tissue toxicity [307, 308]. As CAR therapy expands, so does the need for discovering new cancer-specific biomarkers that can serve as targets. We show some biomarkers with preliminary preclinical data that may be useful as future CAR targets. Cancer/testis (CT) antigens have normal expression limited to adult testicular germ cells, but have shown expression in various tumor cells such as ovarian cancer, lung cancer, melanoma, breast cancer, glioma, and colon cancer [309–316]. Because male germ cells are unable to present antigens to T cells, CT antigens can be targeted with minimal cytotoxicity to normal tissue. While current efforts to target CT antigens are primarily focused on modified high specific TCR regions , there is an opportunity to target these antigens using CAR T cells as well. Guanylyl cyclase C (GUCY2C) is a membrane-bound protein found on the apical surfaces of intestinal epithelial cells, but is also a cancer mucosa antigen that is overexpressed in both primary and metastatic colorectal cancers as well as esophageal and gastric cancers [318–323]. It has been determined that CD8+ T cell responses are expanded when cells are vaccinated against GUCY2C. These cells are effective at eliminating metastatic colorectal tumors [324, 325]. Initial GUCY2C targeting with CAR T cells has shown promising specificity and demonstrated reduced tumor number and increased survival in mice with GUCY2C+ tumors. This target shows potential for the possible CAR T cell treatment of colorectal tumors in human patients. Tumor associated glycoprotein-72 (TAG-72) is a pancarcinoma antigen that shows expression in ovarian cancer , colorectal cancer , breast cancer [328–330], and prostate cancer [331, 332]. While TAG-72 is present in the normal female reproductive tract, the expression is limited and generally weaker than that seen in cancer . While 91% of endometrial adenocarcinoma samples showed TAG-72 expression, the expression of TAG-72 in normal tissue appears to be hormone (estrogen and progesterone) dependent, which can be utilized to prevent expression in normal patient tissue during treatment . As such, TAG-72 may have potential as a possible biomarker for the treatment of some cancer types. Salvage enzymes Thymidine Kinase 1 (TK1) and Hypoxanthine guanine phosphoribosyltransferase (HPRT1) have recently shown potential as surface antigens for CAR T cell therapy. HPRT1 is a salvage pathway enzyme that synthesizes guanine and inosine throughout the cell cycle . The protein is a housekeeping protein that is found within all normal somatic cells in low levels . There is an upregulation of HPRT1 in certain cancer types, making it a promising biomarker for the treatment of these cancers [337, 338]. In addition, the protein has also been shown to have significant surface localization on certain malignancies such as lung and colorectal cancer [339, 340]. As HPRT1 expression is limited to the cytosol within normal cells, the unique surface localization of the protein makes it promising as a targetable biomarker. TK1 is another salvage enzyme responsible for the synthesis of thymidine in the cell cycle and has been used as a serum biomarker for cancer detection and recurrence [341–344]. Recently, there has been evidence that shows that TK1 may also be upregulated within some malignancies and displayed on the surface of the cell . As proteins normally restricted intracellularly, TK1 and HPRT could be used as surface antigens for CAR therapy with minimal bystander cytotoxicity. As CAR T cell therapy expands, so does the search for new biomarker targets for both hematological and solid malignancies. We have provided an analysis of the biomarker targets currently under investigation in clinical trials, in addition to those that may show clinical significance in the future upon further development. Immunotherapy is becoming the new standard in patient care and has experienced huge growth and expansion over the last decade. As CAR T cells become more sophisticated and as new biomarkers are discovered to expand treatment to numerous cancer types, the field of immunotherapy will reach more patients and aid in the improvement of care. MT created the general outline and drafted the majority of the manuscript. GS contributed to the writing of clinically established biomarkers, RR was involved in the revising of the manuscript, KO participated in the design of the manuscript and the revision. All authors read and approved the final manuscript. Cohen IJ, Blasberg R. Impact of the tumor microenvironment on tumor-infiltrating lymphocytes: focus on breast Cancer. Breast Cancer (Auckl). 2017;11:1178223417731565. https://doi.org/10.1177/1178223417731565. Kochenderfer JN, Dudley ME, Feldman SA, Wilson WH, Spaner DE, Maric I, et al. Cytokine-associated toxicity in a clinical trial of anti-CD19 plenary paper B-cell depletion and remissions of malignancy along with cytokine-associated toxicity in a clinical trial of anti-CD19 chimeric-antigen-receptor – transduced T cells. Blood. 2012;119(12):2709–20. https://doi.org/10.1182/blood-2011-10-384388. Ruella M, Maus M V. Catch me if you can: leukemia escape after CD19-directed T cell immunotherapies. Comput Struct Biotechnol J. 2016;14:357–362. Natrix Separations. Available from: doi:https://doi.org/10.1016/j.csbj.2016.09.003. Lai X, Liu J-Q, Dong L, Ou-Yang H-M, Dian Z-J, Song J-X, et al. CD19 epitope escape after 4SCAR19 T cell therapy resulted in re-establishment of chemo-sensitivity in adult B-cell acute lymphocytic leukemia patients. Blood. 2016;128 Cited 22 May 2018. Available from: http://www.bloodjournal.org/content/128/22/1633?sso-checked=true. Doronin II, Vishnyakova PA, Kholodenko IV, Ponomarev ED, Ryazantsev DY, Molotkovskaya IM, et al. T-cell modulatory properties of CD5 and its role in antitumor immune responses. Leukemia. 2007;9:865–77. BioMed Central Ltd. Cited 10 Jan 2018. Available from: https://www.ncbi.nlm.nih.gov/pmc/articles/PMC3583937/. Shao H, Calvo KR, Grönborg M, Tembhare PR, Kreitman RJ, Stetler-stevenson M, et al. Development and validation of diagnostic criteria. Leuk Res. 2013;37:1–9. Available from: doi:https://doi.org/10.1016/j.leukres.2012.11.021. Luo Y, Chang L-J, Hu Y, Dong L, Wei G, Huang H. First-in-man CD123-specific chimeric antigen receptor-modified T cells for the treatment of refractory acute myeloid leukemia. Blood. 2015;126 Cited 16 May 2018. Available from: http://www.bloodjournal.org/content/126/23/3778. Rafiq S, Purdon TJ, Schultz LM, Brentjens RJ. CD33-directed chimeric antigen receptor (CAR) T cells for the treatment of acute myeloid leukemia (AML). Blood. 2016;128 Cited 16 May 2018. Available from: http://www.bloodjournal.org/content/128/22/2825?sso-checked=true. Hunter ZR, Branagan AR, Santos DD, Tournilhac O, Hatjiharissi E, Xu L, et al. High levels of soluble Immunoregulatory receptors in patients with WaldenströM’s Macroglobulinemia. Blood. 2004;104 Cited 16 May 2018. Available from: http://www.bloodjournal.org/content/104/11/4881?sso-checked=true. Agathanggelou A, Niedobitek G, Chen R, Nicholls J, Yin W, Youngt LS. Expression of immune regulatory molecules in Epstein-Barr virus-associated nasopharyngeal carcinomas with prominent lymphoid stroma evidence for a functional interaction between epithelial tumor cells and infiltrating lymphoid cells. Am J Pathol. 1995;147 Cited 16 May 2018. Available from: https://www.ncbi.nlm.nih.gov/pmc/articles/PMC1871000/pdf/amjpathol00046-0286.pdf. Jacobs J, Deschoolmeester V, Zwaenepoel K, Rolfo C, Silence K, Rottey S, et al. CD70: an emerging target in cancer immunotherapy. Pharmacol Ther. 2015;155:1–10. Elsevier Inc.. Available from: doi:https://doi.org/10.1016/j.pharmthera.2015.07.007. American Association for Cancer Research. S, International Cancer Research Foundation. T, William H, Donner Foundation. W, Rosenthal K, Field B, Mesmer D, et al. Cancer research : the official organ of the American Association for Cancer Research, Inc. Membrane proteomic analyses of ovarian cancer identifies the immune modulators CD70 and B7-H2 as candidate markers of cisplatin response. Cancer Res. 2008; Waverly Press. Cited 16 May 2018. Available from: http://cancerres.aacrjournals.org/content/68/9_Supplement/2430. Lin L, Xing L, Acharya CM, Wen K, Liu J, Hsieh P, et al. CD8+ anti-BCMA mRNA CAR T-cells effectively kill human multiple myeloma cells in vitro and in vivo. Blood. 2017;130 Cited 22 May 2018. Available from: http://www.bloodjournal.org/content/130/Suppl_1/3067. Cohen AD, Garfall AL, Stadtmauer EA, Lacey SF, Lancaster E, Vogl DT, et al. B-cell maturation antigen (BCMA)-specific chimeric antigen receptor T cells (CART-BCMA) for multiple myeloma (MM): initial safety and efficacy from a phase I study. Blood. 2016;128 Cited 22 May 2018. Available from: http://www.bloodjournal.org/content/128/22/1147?sso-checked=true. Al-Awadhi A, Lee Murray J, Ibrahim NK. Developing anti-HER2 vaccines: breast cancer experience. Int J Cancer. 2018; Wiley-Blackwell. Cited 29 May 2018. Available from: http://doi.wiley.com/10.1002/ijc.31551. Feng K, Liu Y, Guo Y, Qiu J, Wu Z, Dai H, et al. Phase I study of chimeric antigen receptor modified T cells in treating HER2-positive advanced biliary tract cancers and pancreatic cancers. Protein Cell. 2017; Cited 29 May 2018. Available from: http://www.ncbi.nlm.nih.gov/pubmed/28710747. Papa S, Adami A, Metoudi M, Achkova D, van Schalkwyk M, Parente PA, et al. A phase I trial of T4 CAR T-cell immunotherapy in head and neck squamous cancer (HNSCC). J Clin Oncol. http://ascopubs.org/doi/abs/10.1200/JCO.2018.36.15_suppl.3046. Louis CU, Savoldo B, Dotti G, Pule M a, Yvon E, Myers GD, et al. Antitumor activity and long-term fate of chimeric antigen receptor – positive T cells in patients with neuroblastoma. Mol Ther J Am Soc Gene Ther. 2011;14:1324–1334. Available from: doi:https://doi.org/10.1038/nm.1882%5Cnhttp://www.ncbi.nlm.nih.gov/pubmed/17299404. Ploessl C, Pan A, Maples KT, Lowe DK. Dinutuximab: An Anti-GD2 Monoclonal Antibody for High-Risk Neuroblastoma. 2016;50:416–22. Cited 25 May 2018. Available from: http://www.ncbi.nlm.nih.gov/pubmed/26917818. Burchell J, Poulsom R, Hanby A, Whitehouse C, Cooper L, Clausen H, et al. An alpha2,3 sialyltransferase (ST3Gal I) is elevated in primary breast carcinomas. Glycobiology. 1999:1307–11. Available from: http://www.ncbi.nlm.nih.gov/pubmed/10561455. Julien S, Picco G, Sewell R, Vercoutter-Edouart AS, Tarp M, Miles D, et al. Sialyl-Tn vaccine induces antibody-mediated tumour protection in a relevant murine model. Br J Cancer. 2009;100:1746–1754. Nature Publishing Group. Available from: doi:https://doi.org/10.1038/sj.bjc.6605083. Maher J, Wilkie S, Davies DM, Arif S, Picco G, Julien S, et al. Targeting of tumor-associated Glycoforms of MUC1 with CAR T cells. Immunity. 2016;45:945–946. Elsevier Inc.. Available from: doi:https://doi.org/10.1016/j.immuni.2016.10.014. Mounajjed T, Zhang L, Wu TT. Glypican-3 expression in gastrointestinal and pancreatic epithelial neoplasms. Hum Pathol. 2013;44:542–550. Elsevier Inc.. Available from: doi:https://doi.org/10.1016/j.humpath.2012.06.016. Papageorgis P, Ozturk S, Lambert AW, Neophytou CM, Tzatsos A, Wong CK, et al. Targeting IL13Ralpha2 activates STAT6-TP63 pathway to suppress breast cancer lung metastasis. Breast Cancer Res. 2015;17:1–15. Available from: doi:https://doi.org/10.1186/s13058-015-0607-y. Ono H, Yanagihara K, Sakamoto H, Yoshida T, Saeki N. Prostate stem cell antigen gene is expressed in islets of pancreas. Anat Cell Biol. 2012;45:149–54. Available from: http://www.pubmedcentral.nih.gov/articlerender.fcgi?artid=3472140&tool=pmcentrez&rendertype=abstract%5Cn. Zou Q, Yang L, Yang Z, Huang J, Fu X. PSCA and Oct-4 expression in the benign and malignant lesions of gallbladder: implication for carcinogenesis, progression, and prognosis of gallbladder adenocarcinoma. Biomed Res Int. 2013;2013:648420. https://doi.org/10.1155/2013/648420. Wei X, Lai Y, Li J, Qin L, Xu Y, Zhao R, et al. PSCA and MUC1 in non-small-cell lung cancer as targets of chimeric antigen receptor T cells. Oncoimmunology. 2017;6:1–10. Taylor & Francis. Available from: doi:https://doi.org/10.1080/2162402X.2017.1284722. Dagmara K-M, Mirosław J, Milczek T, Lipińska B, Emerich J. Clinical significance of VEGFR-2 and VEGFR-3 expression in ovarian cancer patients. Polish J Pathol Termedia. Cited 17 May 2018. Available from: https://www.termedia.pl/Journal/-55/Artykul-16683. Cancer Immunotherapy- Clinical Trials.gov. Available from: https://clinicaltrials.gov/ct2/results?cond=Cancer&term=cancer+immunotherapy&cntry=&state=&city=&dist=. Wang L, Ma N, Okamoto S, Amaishi Y, Sato E, Seo N, et al. Efficient tumor regression by adoptively transferred CEA-specific CAR-T cells associated with symptoms of mild cytokine release syndrome. Oncoimmunology. 2016;5:1–13. Taylor & Francis. Available from: doi:https://doi.org/10.1080/2162402X.2016.1211218. Nan J, Li J, Li X, Guo G, Wen X, Tian Y. Preoperative serum carcinoembryonic antigen as a marker for predicting the outcome of three cancers. Biomark Cancer. 2017;9:1–7. Available from: http://www.pubmedcentral.nih.gov/articlerender.fcgi?artid=PMC5345947. Kazarian A, Blyuss O, Metodieva G, Gentry-Maharaj A, Ryan A, Kiseleva EM, et al. Testing breast cancer serum biomarkers for early detection and prognosis in pre-diagnosis samples. Br J Cancer. 2017;116:501–508. Nature Publishing Group. Available from: doi:https://doi.org/10.1038/bjc.2016.433. Arrieta O, Morales M, Dorantes-Gallareta Y, Pena O, Martínez-Barrera L, Morales-Espinosa D, et al. Usefulness of serum carcinoembryonic antigen (CEA) monitoring to define response or progression to chemotherapy and its correlation with survival in patients with advanced non small-cell lung cancer: a prospective cohort study. J Thorac Oncol. 2011;6:S1105. Available from: https://bmccancer.biomedcentral.com/articles/10.1186/1471-2407-13-254. Ahn HS, Shin YS, Park PJ, Kang KN, Kim Y, Lee HJ, et al. Serum biomarker panels for the diagnosis of gastric adenocarcinoma. Br J Cancer. 2012;106:733–739. Nature Publishing Group. Available from: doi:https://doi.org/10.1038/bjc.2011.592. Parkhurst MR, Yang JC, Langan RC, Dudley ME, Nathan DAN, Feldman SA, et al. T cells targeting carcinoembryonic antigen can mediate regression of metastatic colorectal cancer but induce severe transient colitis. Mol Ther. 2011;19:620–626. The American Society of Gene & Cell Therapy. Available from: doi:https://doi.org/10.1038/mt.2010.272. Henry CE, Emmanuel C, Lambie N, Loo C, Kan B, Kennedy CJ, et al. Distinct patterns of stromal and tumor expression of ROR1 and ROR2 in histological subtypes of epithelial ovarian Cancer. Transl Oncol 2017;10:346–356. The Authors. Available from: doi:https://doi.org/10.1016/j.tranon.2017.01.014. Schnell U, Cirulli V, Giepmans BNG. EpCAM: structure and function in health and disease. Biochim Biophys Acta Biomembr. 2013;1828:1989–2001. Elsevier B.V.. Available from: doi:https://doi.org/10.1016/j.bbamem.2013.04.018. Patriarca C, Macchi RM, Marschner AK, Mellstedt H. Epithelial cell adhesion molecule expression (CD326) in cancer: a short review. Cancer Treat Rev. 2012;38:68–75. Elsevier Ltd. Available from: doi:https://doi.org/10.1016/j.ctrv.2011.04.002. Song W, Hwang Y, Youngblood VM, Cook RS, Balko JM, Chen J, et al. Targeting EphA2 impairs cell cycle progression and growth of basal-like/triple-negative breast cancers. Oncogene. 2017;36:5620–5630. Nature Publishing Group. Available from: doi:https://doi.org/10.1038/onc.2017.170. Grada Z, Hegde M, Byrd T, Shaffer DR, Ghazi A, Brawley VS, et al. TanCAR: a novel bispecific chimeric antigen receptor for cancer immunotherapy. Mol Ther - Nucleic Acids. 2013;2:e105. https://doi.org/10.1038/mtna.2013.32. Magee MS, Kraft CL, Abraham TS, Baybutt TR, Marszalowicz GP, Li P, et al. GUCY2C-directed CAR-T cells oppose colorectal cancer metastases without autoimmunity. Oncoimmunology. 2016;5:1–10. Taylor & Francis. Available from: https://doi.org/10.1080/2162402X.2016.1227897. Townsend MH, Robison RA, O’Neill KL. A review of HPRT and its emerging role in cancer. Med Oncol. 2018;35:89. Springer US. Cited 22 May 2018. Available from: http://link.springer.com/10.1007/s12032-018-1144-1, https://www.ncbi.nlm.nih.gov/pubmed/28408844.